The Environment Agency provides a new free service at Gov.UK to provide people in the Calder Valley with river forecasts to help them manage their flood risks. It is being provided by the Environment Agency on the website Gov.UK and shows a 36 hour forecast alongside observed data for the past 5 days. The service covers the River Calder at Walsden, Todmorden, Hebden Bridge, Mytholmroyd and Sowerby Bridge. 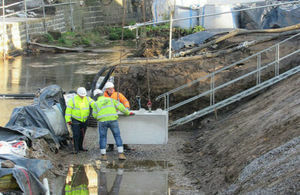 The aim is to help people be more aware of risks and be able to plan for potential flood incidents. Previously, people could view river levels for the previous 5 days, but now they can search by postcode on the river and sea levels service page and see what levels are expected to look like for these rivers over the next 36 hours. These new river forecasts are calculated by computer models that take into account data like current flows and expected rainfall. The introduction of this service follows a successful pilot for people living in the community, including flood wardens, between March and June 2017. The plan is to continue to refine the service, based on feedback from users, before it is rolled out more widely in the future. Forecast information can change quickly, often because of the weather, so people are still advised to sign up for our free flood warning service to get the most up-to-date and accurate situation. our flood warning service is updated every 15 minutes. Why do residents find it useful? We are always looking at ways to use technology to better share information with people. Residents have told us that they would find it really useful to see these river forecasts to help them manage their flood risk. We want people to know if they’re at risk of flooding, be prepared, and take action to protect themselves and their families. A wealth of information is available on our website and we’d encourage everyone to check whether they’re at risk. Sign up for our free flood warnings visit or by tel: 0345 988 1188. As flood wardens we use the river levels service to see what is happening at, not just, our measuring station, but also those up stream. Having the addition of the 36 hours of forecasted level, helps us better prepare and inform our community of what might be expected. People who live in areas where the 36-hour river level forecasts are not available yet can still view data on river levels from the previous 5 days and check for flood warnings.